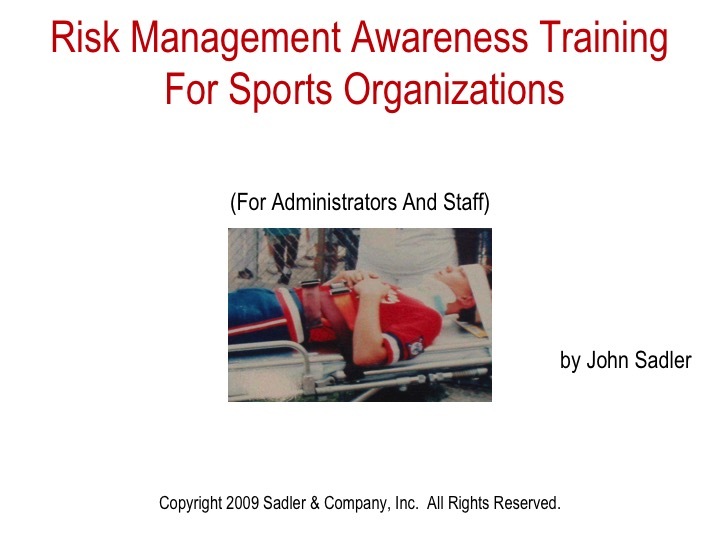 We developed this content to provide risk management awareness training for administrators and staff of sports organizations. This includes training on how to better identify physical hazards and unsafe acts, as well as the standards of care required under the law. Once administrators and staff become aware of these issues and their responsibilities, the practice of risk management can be a natural consequence. Staff refers either to employee or volunteer workers, including coaches, managers, umpires, referees, concession workers, field maintenance workers, etc. Administrators refers to directors, officers, and other personnel who plan, manage, and supervise the organization’s overall operations. This content is directed towards amateur sports organizations in general, but is not sport specific. Each sport and each facility have unique risk characteristics that require additional consideration, which is beyond the scope of this content. Also, this content is directed towards traditional sports that can be found in most community recreation departments. It is not intended to be directed towards extreme or outdoor adventure sports which have their own unique concerns. In addition, awareness training for child abuse and molestation is provided through separate content that is provided in the risk management section of our website. These are the areas that are cited most frequently in textbooks and by sports risk managers. Most lawsuits against sports organizations and their administrators and staff are based on the law of negligence. In order to win the lawsuit under the negligence theory, the injured party must prove all four elements. In other words, a duty of care was owed that was breached and caused the injury resulting in damages. It’s necessary to key in on the duty that’s owed. Administrators and staff must be prudent in performing their job duties; not perfect, just average. Average performance is defined by the standards of care. Its not necessarily good enough to perform up to the standards of the average administrator or staff member in your community. Instead, you’ll be judged on a national standard of care. The national standards of care will be determined by case law, risk management textbooks, risk management articles, sports industry trade publications, expert witnesses, your governing or sanctioning body, and your own safety or risk management manual. The national standards probably require more of you than you would expect. Supervision is defined as overseeing the activities of the sports program including recognizing potential hazards, implementing risk management measures, and monitoring for compliance. Lack of supervision is the most common lawsuit category in the sports context. They are two different types of supervision: general supervision and specific supervision. The duty of general supervision applies to your risk management officer and other administrators, such as officers and board members. They must oversee the big picture of your risk management program by instructing, training, and monitoring staff members on how to carry out their own supervision functions. Meeting the standard of care required under general supervision includes taking some basic steps, such as appointing a risk management officer and adopting a written risk management plan. It also requires selecting appropriate staff and monitoring their performance. Staff selection includes screening staff with applications and background checks. Another element is staff training or certification, such as through the National Alliance For Youth Sports. And of course, a common theme throughout all of risk management is being able to document what you’ve done. Duty to stop rowdiness. Participant roughhousing and rowdiness often results in a senseless injuries. Frequent examples include eye injuries resulting from throwing rocks and falls off bleachers while playing chase games. Location of the supervisor. The supervisor must be in close proximity to an activity in order to personally observe, instruct, and supervise. This concept applies to all situations whether supervising batting practice or the team walking across the street to go to McDonald’s. When youth are involved, the law requires almost constant supervision in close proximity to all activities. Competency of the supervisor. The sports organization is responsible for training competent staff members. Some state laws require youth coaches to be trained. Even if this is not required by state law, a judge or jury would look favorably upon any sports organization that cared enough to do so. The training of administrators and coaches through a reputable online certification or training program can satisfy this duty. Maintain the proper ratios of supervisors to participants. An appropriate number of supervisors should always be present in order to to adequately observe, instruct, correct, and supervise. In some sports, such as basketball, one supervisor per team may be enough. In other sports such as football, one supervisor won’t be enough. Also, the proper ratio depends on the age of the participants. Generally, the lower the age, the greater the required ratio of supervisors to participants. Selection of the size, age, and skill of players. Obviously, when players of greater size, age, and skill are matched with those of lesser size, age, and skill, there is a greater likelihood of injury and a resulting lawsuit. Many of our insurance clients have been sued over the years for failure to comply with this standard of care. Administrators and staff are responsible for instructing participants on sport-specific techniques and skills, game rules, and safety rules. Coaches should always follow the accepted practices for teaching sport-specific techniques. Coaches should be involved in continuing education and should attend workshops and/or study videos from reputable sources. It’s of critical importance that coaches key in on the instruction of the more hazardous areas of your sport. Examples would be the use of techniques to avoid a wild pitch in baseball or proper head positioning during tackling in football. The safety rules of the governing body, sanctioning body, or those that are specific to the sports organization should be stressed. Coaches should be briefed during the pre season on any rule changes. 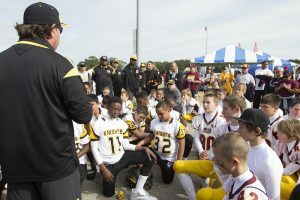 The safety rules should be reviewed with players before and during every practice and game with constant reinforcement. Each safety rule should be explained in terms of the type of injury that the rule is meant to prevent. Administrators are responsible for warning participants of the dangers of participation and getting their informed consent to be subjected to those dangers. The injured party can often prevail in a lawsuit on the theory of failure to warn and failure to provide informed consent, even if there was no other negligence involved. A well-drafted waiver/release form should automatically include an excellent risk warning and informed consent provision that should satisfy your legal obligations in this area. If minors are involved, it’s of critical importance that they sign their section of the waiver/release agreement in order to provide evidence that these legal requirements have been satisfied. A signed waiver / release with the risk warning provision can be used to trigger an assumption-of-risk defense. The first element of sports injury care is prevention. Depending on the nature of the sport and/or age group, preparticipation screening may be a required standard in the form of either a preseason physical or a medical clearance form. In youth sports, such preparticipation screening may only be required for high intensity contact sports such as tackle football. Sport and age appropriate conditioning, flexibility, and strength training may be a required standard. An emergency weather plan should exist for dealing with lightning and severe weather evacuation and shelter. 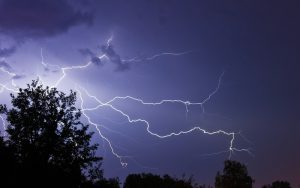 We have an excellent a rticle on lightning safety that explains the national standards in this area. In summary, the 30/30 lightning safety rule calls for evacuation of outdoor activities anytime the length of time between the lightning flash and thunder clap is under 30 seconds. Evacuation must either be to a fully enclosed building or to vehicles. Activities may resume 30 minutes after the last thunder clap is heard. Smart phone apps are available that may assist with these decisions. Education should be provided to all administrators and staff on when to cancel activities due to extreme heat and how to avoid heat illness. We have an excellent article on this topic entitled Heat Illness: Avoidance and Prevention. The second element of sports injury care is preinjury planning. This includes having a readily accessible emergency phone list for EMS, fire, police, and utility companies. It also includes a detailed site map of the facilities that includes facility layout, including all fields, parking areas, and buildings, as well as symbols for the locations of all emergency access points for EMS, first-aid stations, AED locations, fire extinguishers, and utility disconnect/shut-off points. The facility’s exact name and address and the names of nearby roads and intersections should be included. This is essential information for emergency service providers. A copy of the site map should be prominently posted and kept with all first-aid kits. A first-aid kit should be readily available at the facility or carried in the vehicle of each coach or manager. Coaches should know the closest access point for ice or cold packs. In addition, each coach and manager should attend mandatory first aid and CPR training at least every three years. Each coach or manager should also carry the Emergency Information and Medical Consent forms with them at all times, whether in hard copy or electronic format. Precautions must be taken to protect the confidentiality of this sensitive information. The third element of sports injury care is executing your plan. Once the injury has occurred, staff members must assess the magnitude of the injury and initiate appropriate care. When administering first aid, the staff member should never attempt to exceed the scope of his/her training. The purpose of first aid is to stabilize the situation by preventing it from worsening. Once the situation is stabilized, further treatment should be provided by a medical professional. In the event of a medical emergency, staff should call 911 if immediate medical attention is required. The site map should be referred to when so clear instruction can be given as to the location of the facility and the best emergency access point. The Emergency Information and Medical Consent form should be given to EMS upon their arrival as it will include vital information about pre-existing conditions or allergies. Parents should be immediately contacted any time a treatable injury occurs. The risk management officer should be notified in the event of any injury. The risk management officer should document all information about the injury and provide Accident insurance forms to the parent or guardian. 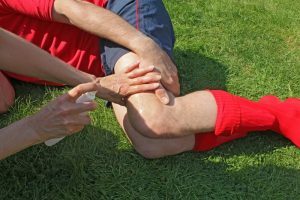 If a player has suffered an injury that requires medical attention, a doctor should make the decision regarding the appropriate time to return to play. The coach should not put pressure on an athlete to return too early and the instructions of the doctor should always be honored. Some organizations may require a post-injury medical clearance form to be signed by a doctor prior to allowing return to play. Lawsuits most commonly arise out of sports facilities due to improper design and layout, uses for which the facility was not designed, trespasser injuries, and lack of weekly, monthly, and seasonal repair and maintenance. First, the design and layout of the facility should meet all current local and state building codes, sport sanctioning or governing body requirements, and standards established by facility design architects. If your facilities are in violation of any of these codes or standards, you should immediately make corrections. A common example would be a baseball facility without fencing or netting to protect spectators from an overthrown ball to first base. Another example would be a basketball facility where obstacles are too close to boundary lines. Second, facilities should be adequate and appropriate for the use intended with regard to size, configuration, and quality. An example of a problem situation would be if a 16 & under baseball team were to conduct a practice on a T-ball field. Another example would be if a wrestling team were to hold a practice in a dance facility with mirrored walls. In both of these examples, it’s possible that modifications could be made to allow for a safe and productive practice. Third, facility owners or lessees should control the access to the facility because they can be sued resulting from injuries to trespassers and even vandals. Its preferable to use fences, walls, locked gates, and locked doors whenever possible. Also, the facility should always post visible signage warning of prohibited uses. In addition, its important to enforce your own rules by prosecuting trespassers. 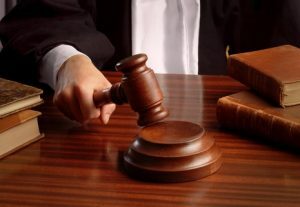 If you fail to do this, you may have waived some of your legal defenses in a lawsuit. Fourth, the risk management officer should develop custom checklists for the systematic inspection, maintenance, and repair of your facilities on a daily, weekly, and seasonal basis. Due to constant heavy traffic and exposure to elements, the condition of facilities are subject to constant change. Also, each facility has unique physical and risk characteristics, and as a result no two checklists will be the same. The checklist schedules with the delegation of responsibilities should be communicated to all administrators, staff, and independent contractors such as janitorial or field maintenance. Detected hazards should be immediately communicated to the risk management officer so corrective action can be taken. In the meantime, staff may need to either reschedule or modify practice/games to address the hazards. The recognition of all hazards along with the corrective actions taken should be documented in writing. Equipment is defined as any item worn or carried by a participant when taking part in a sport. It includes personal protective gear, team protective gear, and game-related equipment. When an equipment problem is related to an injury, numerous parties will likely be sued. The obvious ones are the equipment manufacturer and distributor. They will be sued under the theory of faulty design, faulty manufacturing process, or faulty instructions. In addition, sports organizations and their administrators and staff are often shotgunned into these lawsuits based on a number of different theories of recovery. Below are the most common equipment areas where the national standards of care are breached. All of the standards apply to both sports organization-supplied equipment and athlete-supplied equipment. All equipment must be used only for its intended purpose as prescribed by the manufacturer. Administrators and coaches should review manufacturer specs on intended uses, appropriate age group, capabilities and limitations. Equipment should comply with all standards including the governing body, your sports organization, and NOCSAE. Avoid modifying equipment as this may void the manufacturer’s warranty and shift liability to your sports organization. In general, only the manufacturer’s representative should modify equipment. The only exception is that some equipment is designed to be modified to meet certain needs, such as fitting. In such cases, modifications should only be made according to the original manufacturer’s instructions. Perform research before selecting equipment for purchase. Only purchase high quality equipment that meets all applicable standards of your governing body and NOCSAE. Always follow the manufacturer’s instructions concerning intended use. Always make sure that the equipment is age group appropriate. The condition of equipment is constantly changing due to misuse, collisions, wear and tear, and other environmental factors. 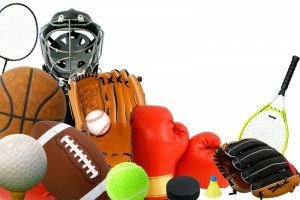 The sports organization’s equipment manager should inspect all equipment during the preseason and replace as necessary before issuing team equipment. Equipment must be inspected for defects on a routine basis. Athletes and coaches should inspect all equipment prior to each game and practice. Upon discovery of a defect, an adult qualified to make repairs should be available to do with the proper tools at hand. If repairs are not possible, spare equipment should be available. Coaches and managers should make sure that all equipment fits properly. Improperly fitting or modified equipment can result in liability. Maintenance and repair of equipment should take place on a routine basis. Maintenance is defined as the ordinary upkeep of equipment, such as tightening of screws, cleaning and restoring air pressure. Repair is defined as the replacement of worn/broken parts or correcting major problems. Maintenance and repair should only be undertaken by a someone qualified who follows the manufacturer’s written guidelines and specifications. Whenever in doubt, it’s best to transfer the liability risk to a manufacturer’s representative. Reconditioning is an attempt to restore equipment to like-new condition. The safest thing to do is transfer the liability risk of reconditioning to a reputable reconditioning business approved by the manufacturer. Be aware that reconditioning may require NOCSAE recertification. Equipment should be replaced per manufacturer’s guidelines. Such replacements should be planned and budgeted for well in advance. In larger organizations, every year a certain percentage of equipment should be replaced to avoid wide variations in the quality and age of equipment. Written documentation of repairs and reconditioning should always be maintained for all equipment. The use of autos to transport participants presents a high risk of potential damages and corresponding liability. Auto accidents tend to cause severe injuries to multiple passengers. We commonly see two types of transportation of participants in the sports context. The first is group transportation, such as when an entire team is transported to an out of town tournament. This could be in a single large vehicle or a caravan of smaller vehicles. The second is when an individual staff member either volunteers or is asked by a parent to provide transportation for their child to and from practice or games. Both of these situations result in potential liability to not only the owner and driver of the vehicle, but also to the sports organization and its administrators. The sports organization may be vicariously liable for the negligence of the driver. In addition, the sports organization and administrators may be liable for negligent driver recruitment if the driver has an unacceptable driving record or for improper vehicle selection if a 15-passenger van is selected. For these reasons, transportation of participants is a risk that should be avoided and is best left up to the parents. If your sports organization chooses not to avoid these risks, then guidelines should be followed to mitigate the risks. However, these guidelines can be time consuming and can present a significant administrative burden. The risks from group transportation of participants can be mitigated by implementing standard controls. The first step is to establish written driver disqualification criteria where certain violations or multiple violations within a certain time period will result in driver disqualification. We provide recommended driver disqualification criteria under our sample broader risk management plan. Written permission should be received from each driver to run a motor vehicle record check. After the motor vehicle record check is run the results should be compared to the disqualification criteria to determine if the driver is an eligible driver to provide group transportation. The second step is to make sure that appropriate vehicles are selected. Never, use 15-passenger vans due to the National Highway Traffic Safety Administration’s documentation of their propensity for tipping over. The fact that many state statutes prohibit their use for the transportation of students and that churches are phasing them out should tell you something about their risk. We have an excellent article on this topic entitled “12- and 15-Passenger Vans.” In addition, 12-passenger vans and SUV’s don’t fare much better than 15-passenger vans. Instead, you should use a vehicle that qualifies as a school bus and your driver should have a CDL or commercial drivers license. Another acceptable alternative is to caravan your participants in minivans or private passenger sedans. The usage of seat belts by the driver and all passengers should be mandatory. In addition, the driver should never use a cell phone or text while driving. Sufficient auto insurance is critical. 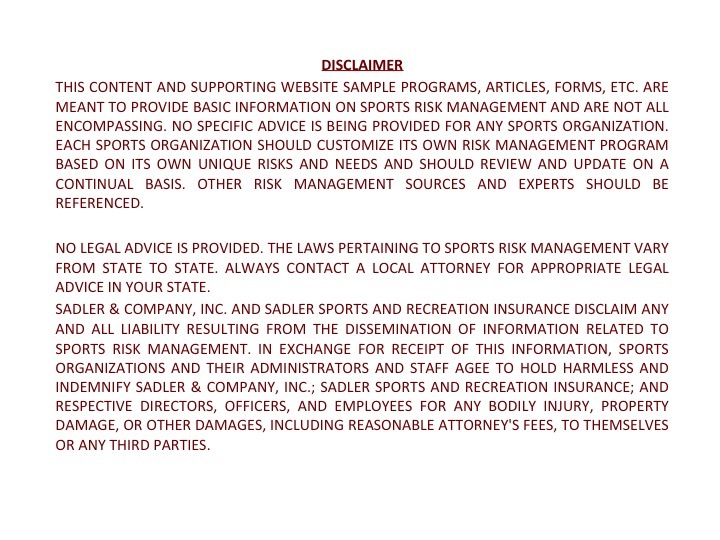 Your sports organization should always carry Non-owned and Hired Auto Liability with a limit of at least $1,000,000. 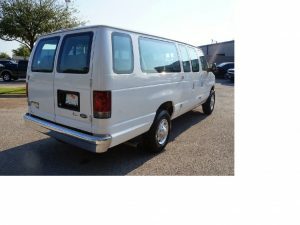 Even if you carry this coverage, many policy forms exclude coverage for the use of 15-passenger vans and may have other limitations regarding the transportation of participants. Review your policy carefully. If renting a vehicle, consult with your insurance agent about whether or not to buy coverage from the rental car company. This is a very tricky area. If borrowing a vehicle from a church or if a staff member is going to provide their vehicle, require proof that auto liability insurance is in force on the vehicle with a limit of at least $500,000 combined single limits or similar split limits. The risks of individual staff provided transportation of participants can also be mitigated by following accepted guidelines. One approach is for your sports organization to not prohibit such transportation, but to instead communicate that such transportation is not authorized and is a private matter between the staff member and parent/guardian. This communication should be in a written form to all parents or guardians prior to the start of the season. You may want to suggest that staff members get written permission from parents/guardians before any such transportation is provided. In addition, staff members should be reminded that if they do provide transportation, they should not violate the abuse/molestation guidelines about being alone with a single, unrelated child. Another approach, which is stronger but more time consuming, is to only allow transportation by authorized staff member drivers who are approved after successfully passing a motor vehicle record check and providing evidence of sufficient personal auto liability insurance in the amount of at least $500,000 combined single limits or similar split limits. Of course the use of seat belts should be mandatory and the driver should never use a cell phone or text while driving. The sports organization should always carry Non-owned and Hired Auto Liability insurance with a limit of at least $1,000,000. Being aware of the most common problem areas that lead to sports injuries and litigation and what’s expected of you under the national standards put you in a better position to identify potential hazards and take appropriate action. For more resources on sports risk management, please be sure to check out the risk management section of our website.